Mike Posner is a pop singer best known for his hits “Cooler Than Me” and “I Took A Pill In Ibiza”. Many would consider him a two hit wonder, and say that he’s nothing than a reminder of a pop song people forgot. However, over the years, he has evolved and grown a lot as an artist. On January 18, 2019, Posner released his third studio album, A Real Good Kid. This new album heavily centers on the themes of love, loss, and eventual acceptance. Over the two year period that this album was recorded, Posner lost his father to brain cancer, and his best friend Avicii to suicide. This loss and acceptance can definitely be felt on tracks like “Move On” and “How It’s Supposed To Be”. The track “Song About You” is the first single off this album, and was released in September 2018 with a music video. Mike Posner wears optical white chucks in this music video. The song is a breakup song, which on its surface may not seem like an original concept, but this take from Posner shows that he is not pining over his ex. Instead he is scorned and looking to move on as quickly as possible. While he admits that he does miss her a lot, Mike is dead set on not giving in and moving on. The hook is very catchy and the drums really thump, giving the sense that you are trudging through this breakup, but are still dead set on making it to the end. Everything is fine, pay no attention to what’s going on behind me. 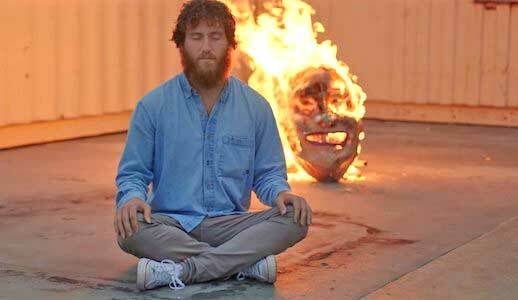 The music video begins with a burning mask that is actually the mask from the “I Took A Pill In Ibiza” music video, the megahit from Mike Posner’s last album. The camera then pans out and Mike comes into frame. 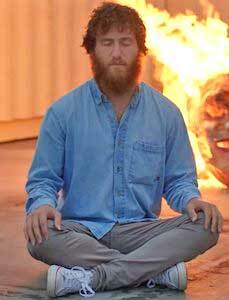 He’s seated cross legged in front of the mask wearing a baby blue shirt, khakis, and a pair of white chucks. He has a look of serenity on his face as he keeps his eyes closed, and basically holds the same position for the whole video. The mask continues to burn in the background, slowly melting away Posner’s past persona until only his peaceful current mental state remains. 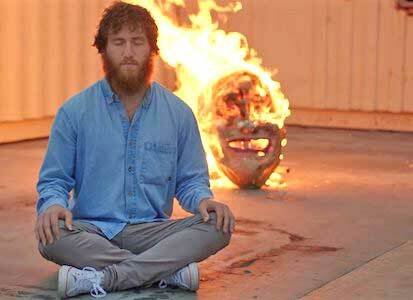 It’s a very symbolic video that perfectly captures the themes of Mike Posner’s latest album, and showcases how the singer has matured and that he is ready to head into a new direction in both his career and life. These are three different pictures. Use the links below to get a new pairs of chucks to meditate in.